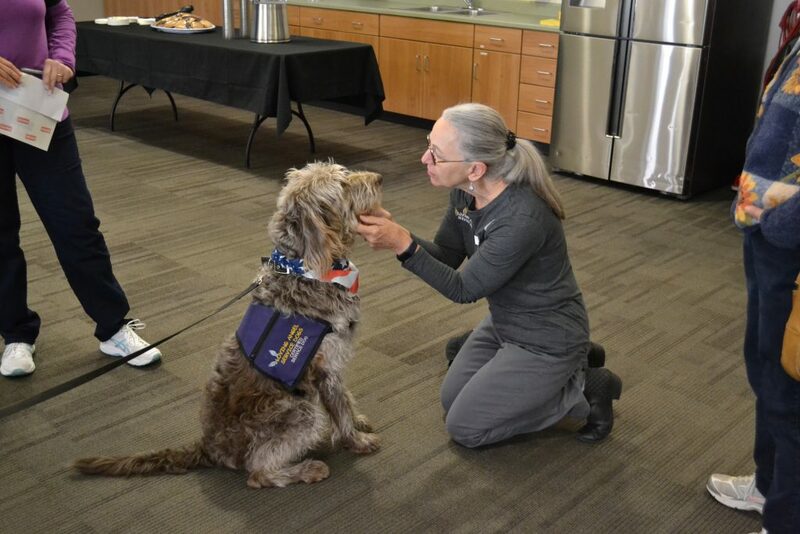 IVINS — A furry therapist of sorts has joined the staff of a Southern Utah rest home to help provide comfort to veterans of the U.S. armed forces. During a presentation at Southern Utah Veterans Home in Ivins Monday afternoon, St. George-based Loving Angel Service Dogs placed a fully trained service dog with the facility. “Ginger,” a shaggy female Labradoodle, will work with the facility’s recreation therapists as a comfort animal to provide one-on-one and group-based attention to the many elderly veterans who reside at the home. 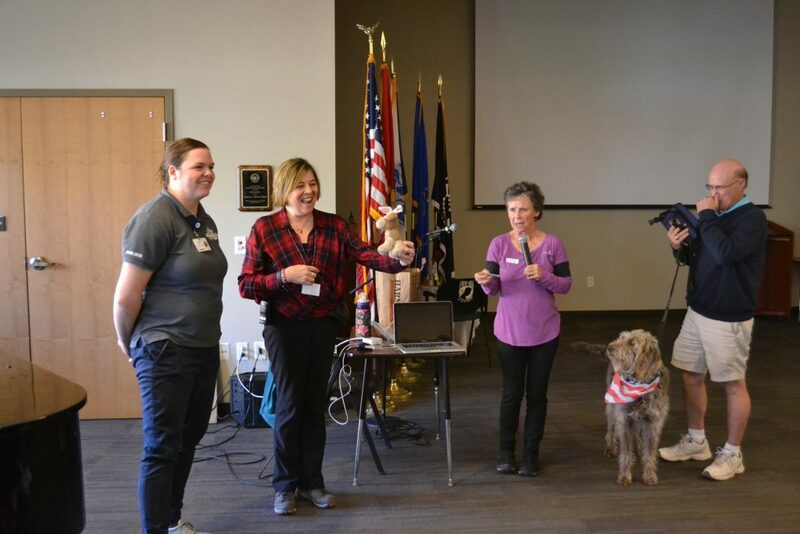 “We’re excited to have Ginger with us and so many of our veterans who will benefit from her love and her care,” Southern Utah Veterans Home Recreation Director Kate Ostler said. Administrative Director Jerry Olson said having a service dog has been a dream for the Veterans Home for nearly a year. As luck would have it, he learned about Loving Angel after reading a previous St. George News story about the nonprofit and arranged to have a service dog placed at the facility. Ginger completed three months of training with facility staff and residents and is now ready for full-time service. Ginger is no stranger to working with service members, having previously served a single veteran full-time before moving on to work as a facility dog. She will work with residents throughout the day and then be brought home on evenings and weekends in the care of the facility’s recreation assistant, Valerie Hennessey. “Ginger is an amazing dog – I cannot imagine a better facility dog – a dog to love all of you guys and the people that come,” said Cathy Powell, founder and executive director of Loving Angel Service Dogs. 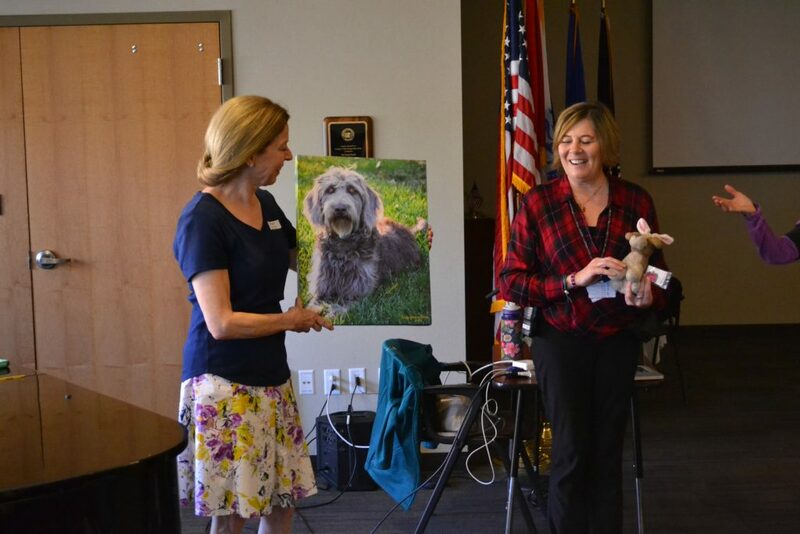 At the end of the presentation, Powell handed the dog off to Hennessey, sending with her a favorite toy and a custom-embroidered Loving Angel leash. The emotional handoff was highlighted by a resolve to continue the work that Powell and an army of volunteers perform in training service dogs for those most in need. “We did this for purposes like this to place the dogs, but that doesn’t mean that we don’t miss them. She’ll always have a very special place in our heart,” Powell said as she relinquished Ginger to the Veterans Home. Loving Angel was founded in 2012 as a charitable organization that specializes in training and placing service dogs for people with disabilities, such as children with autism, adults with mobility issues or veterans suffering from post-traumatic stress disorder. The animals are provided to recipients for a nominal fee. Powell and her husband, Hoagy Powell, run the full-time operation out of their home in Bloomington, with assistance from volunteers who help with the enormous task of training, feeding, grooming and cleaning up after as many as eight puppies-in-training at a time. Since its founding, the charity has provided over a dozen dogs to people in need throughout Southern Utah and beyond, many of whom are veterans from conflicts as recent as the Iraq War. “With great love, we give y’all Ginger,” she said to the gathered audience of grateful veterans and facility staff. For information about volunteer opportunities at Loving Angel Service Dogs or to make a donation, visit the organization’s website, email director@lovingangelservicedogs.com or call 435-632-2482.